Welcome to my home on the World Wide Web. Please enjoy you visit here! You will find lots of photos of my animals having fun, just being themselves and I hope a little information along the way. This Page is under construction and I hope you will come back again to see the changes . Please feel free to write to us, we love email. We also enjoy comments about the web page we have put together for our beloved dogs. Pet or Predator Control? Brilliant articals written by Chris and Bev Franks reprinted here with permission from Chris Franks. Working PMA Info at Dunluce For brilliant info on bonding and studies on working PMA do have a good look at this brilliant site. Agostino Molinelli This is a great web page with very nice Maremmano Abruzzi dogs. Firebird Another great zoi site to visit. 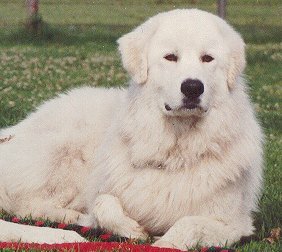 dei Tratturi Here we have a new Belgian Maremma site. Tim Douglas' Maremma Page A look here is a must. Dog World Canberra a great place to shop. Melville House is a brilliant Art Deco B&B in Lismore, what a great place to stay this was. Not only were we made to feel right at home but the dog was (perhaps) more welcomed still. Breakfast was superb as was the accommodation. I think we shall stay there from now on when we visit Lismore. of good information in 3 languages.